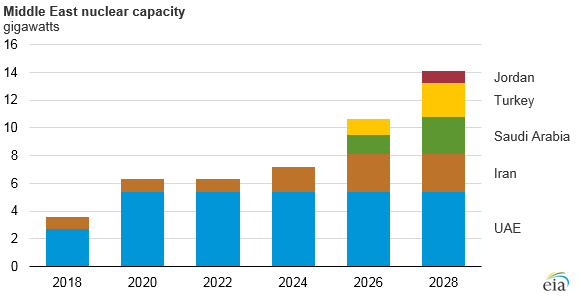 Nuclear electricity generation capacity in the Middle East is expected to increase from 3.6 gigawatts (GW) in 2018 to 14.1 GW by 2028 because of new construction starts and recent agreements between Middle East countries and nuclear vendors. The United Arab Emirates (UAE) will lead near-term growth by installing 5.4 GW of nuclear capacity by 2020. The growth in nuclear capacity in the Middle East is largely attributable to countries in the region seeking to enhance energy security by reducing reliance on fossil fuel resources. Fossil fuels accounted for 97% of electricity production in the Middle East in 2017, with natural gas accounting for about 66% of electricity generation and oil for 31%. The remaining 3% of electricity generation in Middle East countries comes from nuclear, hydroelectricity, and other renewables. Middle East countries are also adopting nuclear generation to meet increasing electricity demand resulting from population and economic growth. Regional electricity production was more than 1,000 billion kilowatthours (kWh) in 2017, and EIA expects electricity demand to increase 30% by 2028, based on projections in the latest International Energy Outlook. This growth rate is higher than the average global growth rate of 18% over that same period, and higher than the 24% expected growth in non-OECD (Organization for Economic Cooperation and Development) countries. Iran is building a two-unit nuclear plant, Bushehr-II, which is designed to add 1.8 GW of nuclear capacity when completed in about 2026. 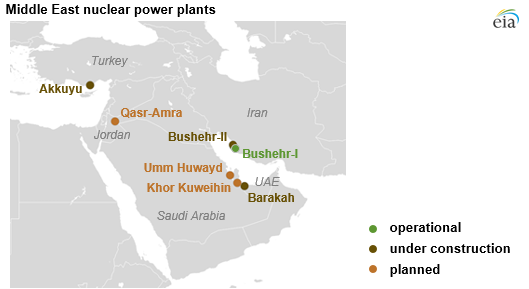 Iran's original Bushehr-I facility, which came online in 2011, was the first nuclear power plant in the Middle East. Bushehr-I has one 1.0 GW reactor unit producing about 5.9 million kWh of electricity per year. The UAE is currently constructing the four-unit Barakah nuclear power plant, which is expected to be completed by the end of 2020. The 1.3 GW Barakah unit 1, which was started in 2012 and completed in 2017, is expected to begin electricity production by mid-2018. Turkey began construction of the Akkuyu nuclear power plant in late 2017. Akkuyu is a four-unit facility designed to add 4.8 GW of nuclear capacity to Turkey's generation mix. The first reactor unit is scheduled to be completed by 2025. Saudi Arabia is planning to build its first nuclear power plant and is expected to award a construction contract for a 2.8 GW facility by the end of 2018. It has solicited bids from five vendors from the United States, South Korea, France, Russia, and China to carry out the engineering, procurement, and construction work on two nuclear reactors. Construction is expected to begin in about 2021 at one of the two proposed sites—either Umm Huwayd or Khor Duweihin. Jordan plans to install a two-unit 2.0 GW nuclear plant and has been conducting nuclear feasibility studies with Russia's Rosatom since 2016. In early 2017, Jordan solicited bids for supplying turbines and electrical systems, and construction is expected to begin in 2019 and to be completed by 2024. More information about Middle East nuclear capacity projections is available in EIA's International Energy Outlook 2017.